IRISH RAIL IS set to launch its new accessibility programme on its Dart services this Monday. It will mean that wheelchair users, or others who require assistance getting to and from the train, will only need to notify the relevant station four hours in advance, rather than the existing 24-hours notice. As part of the launch, Irish Rail staff and regular users of the accessibility services will take the Dart from Connolly to Howth and then back again. Monday will also mark the introduction of a new hub system at stations, whereby a number of fully manned rail stations will act as hubs with staff attached to these travelling to other stations to assist customers when necessary. The issue of the 24-hours notice needed gathered momentum last year after a wheelchair user told RTÉ Radio One’s Liveline that she was forced to wait 15 minutes for Irish Rail employees to help her exit a train. “When I got to Connolly then, I had to wait 15 minutes for someone to come get me off the Dart,” Saoirse Smith said. They didn’t know I was on my way. Thank god for these kids that stood in the door and made sure it didn’t close. I just felt really embarrassed. I’m holding up everybody and they can’t go where they want to go, because I’m waiting to get off the Dart. Last July, a spokesperson for the Irish Wheelchair Association (IWA) told TheJournal.ie that providing at least 24 hours notice is a major issue for its members. 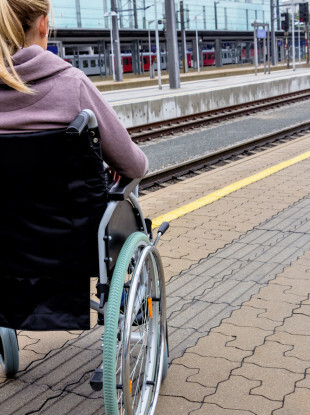 “This is quite a major issue for quite a few of our members, especially people with disabilities living in rural areas because there are many trains and train stations that are unmanned throughout the country,” the spokesperson said. The mandatory notice is specifically troubling to those who need to travel last-minute, according to the IWA. It’s a barrier for people if they want to travel spontaneously, or in emergency situations they will be unable to travel because they haven’t provided the local station with 24-hour notice. At the time, Irish Rail said it was undertaking a full review of the customer experience, including input from the Irish Wheelchair Association and the NCBI. Email “New system on the Dart to slash the notice needed for wheelchair users to access service”. Feedback on “New system on the Dart to slash the notice needed for wheelchair users to access service”.